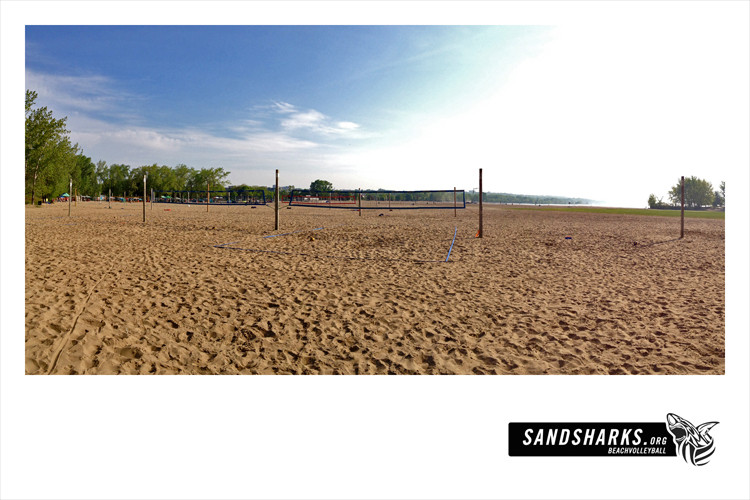 Welcome to Toronto SandSharks Beach Volleyball, a group of over 300 hard-hitting LGBT and homo-friendly athletes who sweat it out in grueling games of 2-on-2 every summer. We've been around since 1998 as a non-commercial volunteer-run group catering mainly to tournament-calibre indoor and beach tour players. Go ahead. Bring your game! You already play lots of volleyball or other high-cardio team sports. Now you want to try 2-on-2 beach volleyball, one of the most demanding sports out there. This is all-out cardio assault. In public. No substitutes. No time-outs. You'll have to make plenty of spectacular plays. Under a hot sun, on hot sand, wearing pretty much nothing. You'll be caked in sand, dripping sweat, gasping for air. And you'll love every aching minute. As every SandShark does. Interested in joining? Come to one of our clinics, or contact us at info@sandsharks.org. Visiting from another LGBT sports league? Get in touch with us! We'd love to see you at the beach. You do not need to bring a partner. In fact you cannot play with the same person more than once each day. A great way to spend a summer! To keep things social, our main rule is that you must pair with a different player every game and with all players of all calibres as equally as possible throughout the season. Between games, relax with new friends. After an exhausting day at the beach, get a group together and reload your severely depleted carbs over dinner. It's a fantastic way to build a network of friends. Saturdays and Sundays throughout the summer, at the eastern Beaches or at Hanlan's Point. From early to exhaustion. Come play for a few hours or make a day of it. Sometimes we play on weeknights too, depending on the weather and the hours of daylight available after work. Contact info@sandsharks.org for more info. The 2018 beach season has begun!! Join us anytime!